Happy Monday! Ready for today's Monday Meme? This one definitely takes me back to my childhood. I was obsessed with Scooby and the rest of the gang from Mystery, Inc. when I was younger. I was pleasantly surprised that my now 18 year old nephew also enjoyed it when he was little. My six year old son still counts it among his favorite shows, which warms my heart. In some ways, I'd like to think that Scooby Doo had a little something to do with my decision to become involved in paranormal research. It was the first time I saw a group of everyday people actually investigate 'paranormal' mysteries...and pretty much solve them all! 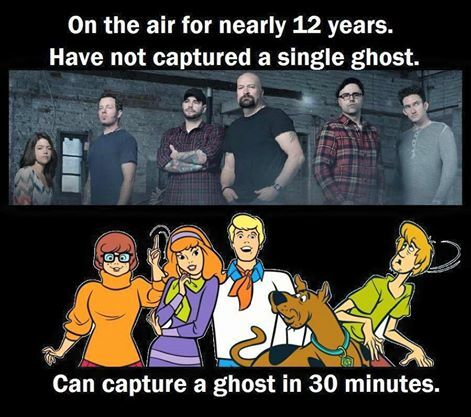 I don't think I'm alone---in fact, I've actually heard many paranormal investigators give at least partial credit to Scooby Doo for sparking their interest into researching the unknown. In a similar vein, many paranormal investigators also give credit for their start in the investigation world to the original TAPS team, as featured on Ghost Hunters. Although not perfect, at the time, the show really was somewhat revolutionary. Just like Scooby, you had a group of everyday people investigating mysteries of the unknown. It was, and continues to be, one of the more accurate portrayals of the investigation process available on network TV. I was never a HUGE Ghost Hunters fan, but I've watched my fair share of episodes over the years and loosely follow their work. I do respect the team for their contributions to paranormal research...which is why I felt the need to point out a huge problem with today's meme, lol. Yeah, Scooby and the Gang could wrap up a case in less than 30 minutes...but there was a reason for that. In Scooby, the bad guy was always a shady real estate developer, a group of smugglers, or a disgruntled family member left out of a will. The mysteries were solvable because there was a rational explanation.